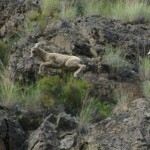 Currently viewing the category: "Bighorn Sheep"
Yes, it looks like pneumonia. It usually is. It comes from domestic sheep most of the time. Bighorn sheep near the northern entrance of Yellowstone National Park are dying from pneumonia. 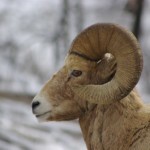 Pneumonia outbreaks in bighorn sheep are often associated with contact with domestic sheep or goats which carry many pathogens that cause pneumonia in bighorn sheep but do not affect domestic sheep or goats. Groups File Notice of Intent to Sue Over Sheep Experiment Station. Conservationists Settle Lawsuit Against Experimental Sheep Station After Grizzly Goes Missing.